We have been presented with THE SPECTRUM AWARD FOR EXCELLENCE IN CUSTOMER SERVICE. Now there are even more reasons to stop by and see us today! 2017 New Years Eve Party at The Door! The best party on the peninsula to ring in the New Year – No Cover! There’s something for everyone at The Swingin’ Door. Join us this Sunday for the Best Super Bowl Party on the Peninsula. 2 100″ screens and 10 flat screens throughout? Always the Best Party on the Peninsula. See you on Thursday???? 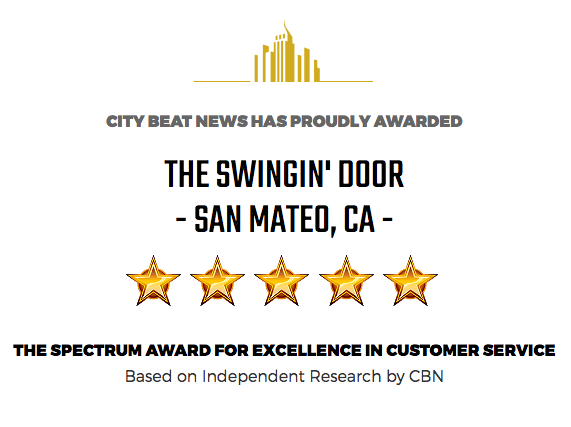 The Swingin’ Door IS BEING HONORED AS A WINNER OF THE 2015 SPECTRUM AWARD FOR SERVICE EXCELLENCE! It’s official — People on Yelp love The Swingin’ Door! Thank you for making us a 2015 Recipient of the “People Love Us on Yelp” Award. Read more here. Buying some-one a drink is five times better than a handshake. If some-one offers to buy you a drink, do not upgrade. The month has just begun and one event is already sold out. The other two are very close as well, so reserve your space today!